Where to Eat at the Beach is Tybee Island’s shopping, restaurant and activities guide. It can be found in boxes all over Tybee and is FREE to the public. 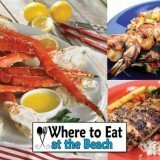 In every issue of Where to Eat at the Beach you will find full restaurant menus, coupons to activities & attractions, and a very useful map of Tybee Island’s area attractions and restaurants. Our distribution locations are found on Tybee and the Savannah Islands. We print 150,000 copies a year! Our key locations include all of the Yellow Boxes on Tybee, restaurants, hotels, inns, b&b’s, stores, shops, the Lighthouse and Museum, the Tybee Island Visitor Center, City Hall and almost every vacation home on the Island. We refill weekly in the off season and 2 to 3 times a week in the high season. Included. Free for Annual Advertisers! With our online digital magazine our readers are able to click directly through from your ad to your website. All ad design, photography, graphic design, is included in the price of your ad! We will take the time to make your ad the way you want it for No Additional Charge! For more information on Where to Eat Tybee, take a look at our media kit below.